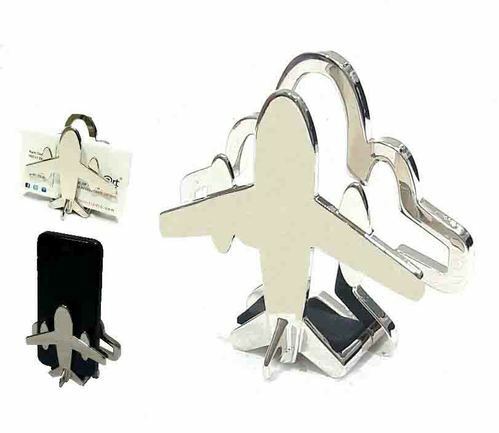 Our range of products include house visiting card holder, plane visiting card holder, aeroplane card holder, cardy- visiting card holder, carduo- visiting card holder and cardy 2- visiting card holder. 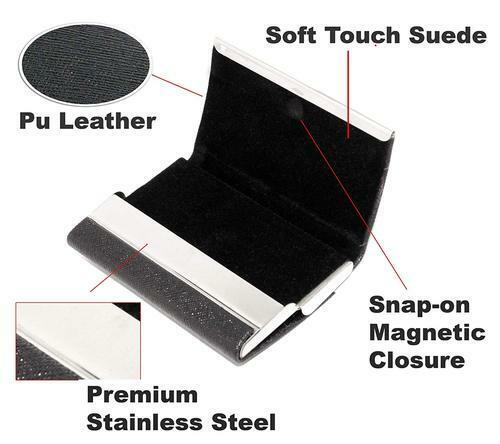 2 Sided Card Holder, Front & Back Elegant Metal Finish Magnetic Cover. Stylish Compact Design-Pocket Sized - Carry it Along in Your Pocket or Keep it in your Purse, Bag etc. Keep your cards clean and unbent, magnetic shut and interior soft lining provide more protection to your card. One Pocket To Store Your Cards And Another For The Ones You Receive. 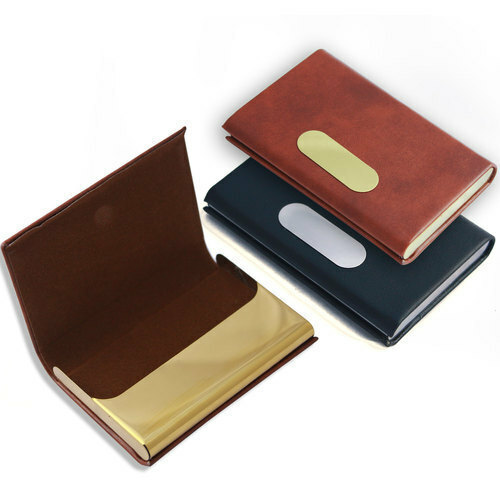 Great quality of 100% handmade leather, holds plenty of cards and you will love the idea of both sides of holder with magnetic closures are strong enough can be opened and closed magnetically. 100% handmade leather that made of great quality easy to open and doesn't leave you fumbling in front of your client. Stainless steel with PU leather surface,Stylishly designed with high quality leather & stainless steel, ensuring a professional, great looking finish and make the case durable. Can be used to carry business cards, credit cards, ID card and note. Compact design to fit easily into your pocket. Double sided designed, which allows you to carry more business cards and it still fits in your pocket. Business card holder has 2 sections one from the front and back. 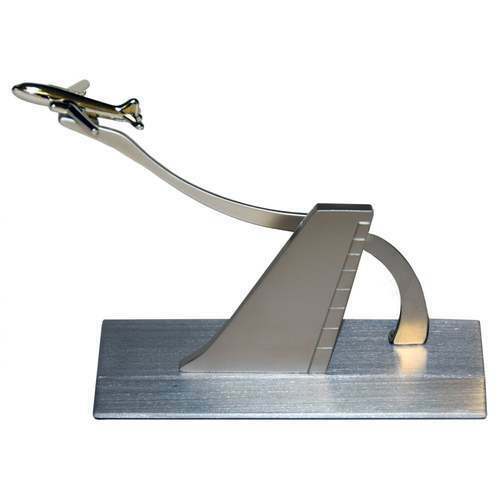 Business card holder can be opened and closed magnetically. Velvety Interior, Magnetic Lid and Stylish Stitched Leather Finish Exterior. Note :Product color may slightly vary due to photographic lighting sources or your monitor setting. 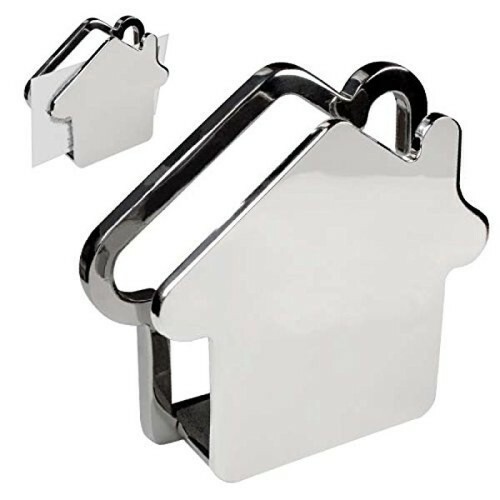 2 Sides Card Holder, Front & Back Elegant Metal Finish Magnetic Cover. Capacity :Stores approximately 7-8 business cards OR 4 Debit/Credit bank cards depending upon thickness of cards. Maximum Capacity: Stores approximately 7-8 business cards OR 4 Debit/Credit bank cards depending upon thickness of cards. Sleek Design & Holds About Many Business Cards Depending on Thickness of Cards . 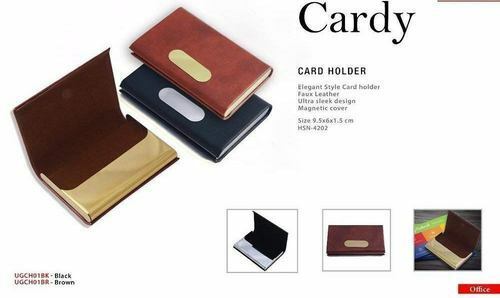 Looking for “Visiting Card Holder”?